Could El Niño Save California From This Year's Drought? El Niño seems to be on its way this year, with current odds placing it at 80% that we'll see it by the fall. 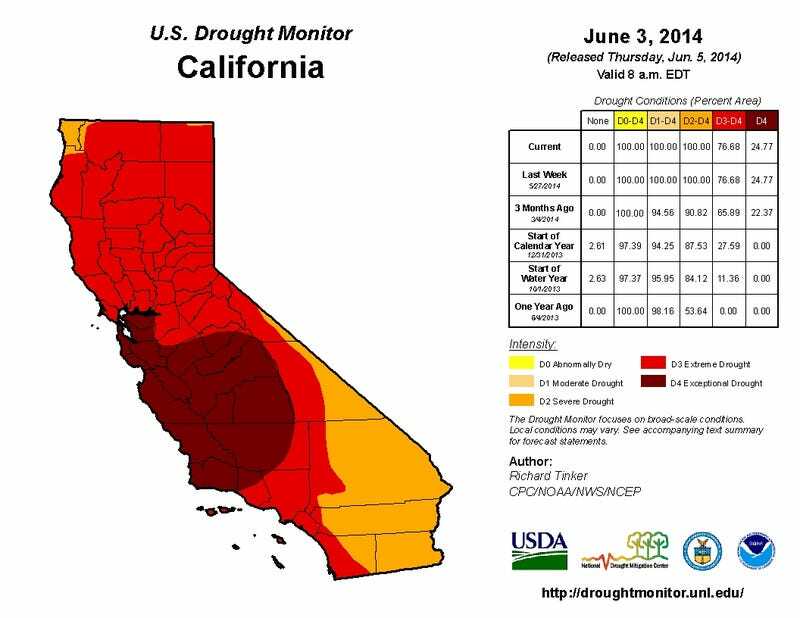 But would El Niño's arrival really mean a little relief for drought-stricken California? A look at the last 60 years of what El Niño has done to the state is pretty revealing. NOAA's Climate Prediction Center Acting Director Mike Halpert joined us today to take questions on El Niño and its potential impacts, including one about whether its arrival this year might bring the famously sunny state something it's been sorely missing: rain. Even if El Niño does show up in California though, it turns out that strong rains may or may not come along for the ride. As a resident of the very dry California, is it a given that El Niño will increase our chances of water falling from the sky (what I believe some people call 'rain')? The relationship between El Niño and rainfall over California is somewhat dependent on the eventual strength of the episode. The stronger El Niño is, the better chance that California sees above average rainfall during the winter season. For instance, during the two strongest events in the past 60 years (1982/83 and 1997/98), well above median rainfall amounts fell across the entire state of California. Median or above median precipitation was recorded over the entire state during strong episodes in both 1957/58 and 1972/73. However, strong events in 1991/92 and 2009/10 only provided small surpluses in the southern part of the state, while precipitation during 1965/66 was generally average to below average across the state. For weak and moderate strength episodes, the relationship is even weaker with approximately one-third of the events featuring above-average precipitation, one-third near-average precipitation, and one-third below-average precipitation. On the bright side, we see the chance of La Niña developing quite remote, so at least you won't have that going against you next winter. Of course, there's more to a drought ending than just the amount of precipitation you get — how that precipitation comes in, over what time period it's distributed, and how much groundwater supplies have been leaned on in its absence are all important. A dry, depleted landscape suddenly being flooded by pounding rains won't yield quite the end to the drought that is hoped for.